Who’s James Beard? And why do we care?? Whenever I see that a restaurant or chef has a James Beard award I’m impressed and I know it’s a prestigious award, but why? I decided to get the details on this James Beard character. Coined the “Dean of American cookery” by the New York Times in 1954, James Andrew Beard is known as a pioneer foodie. Beard was born on May 5, 1903 in Portland, Oregon. Beard briefly attended Reed College in Portland but in 1923 he left to pursue his dreams of being in theatre. He returned to the United States in 1927 and continued to pursue his dreams but his big break wasn’t happening and in 1935 he opened a catering business. With the opening of a small food shop called Hors d’Oeuvre, Inc., in 1937, he finally realized that his future lay in the world of food and cooking. In 1940, Beard wrote what was then the first major cookbook devoted to cocktail food, Hors d’Oeuvre & Canapes. He followed up this book with another, Cook it Outdoors. During the war years, he served with the United States Seamen’s Service, setting up the sailors’ canteens in Puerto Rico, Rio de Janeiro, Marseilles, and Panama. Beard returned to New York in 1945 and immersed himself in the culinary community. For the next 10 years he wrote multiple cookbooks and appeared on television’s first cooking show on NBC in 1946. He then contributed articles and columns, served as a consultant to many restaurateurs and food producers, and ran his own restaurant in Nantucket. Beard established the James Beard Cooking School in 1955 and continued teaching for the next 30 years. He was tireless in sharing his message of good food, prepared with fresh ingredients. He also continued writing cookbooks that have become classics. James Beard passed away at the age of 81 on January 21, 1985. He left a legacy of culinary excellence and integrity. Today, we most often hear his name related to awards given to chefs, restaurants, and more. 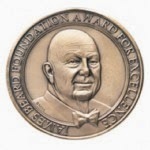 The James Beard Foundation Awards, established in 1990, recognize culinary professionals for excellence in their fields. The award covers all aspects of the industry- from chefs and restaurateurs to cookbook authors and food journalists to restaurant designers and architects and more. The Beard awards are the highest honor for food and beverage professionals working in North America.